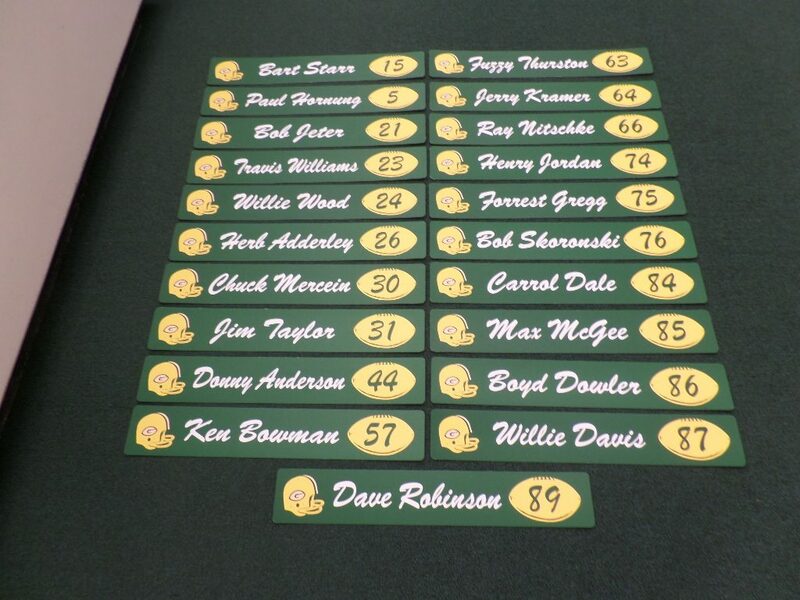 We Are Offering this Collection of Green Bay Packers Reproduction Locker Room Name Plaques similar to those that would have hung in the Packer's Locker Room circa 1967. There are 21 different plaques, each with the name, jersey number and Packer Helmet printed on it. The plaques are thin cardboard paper stock and measure 18" long by 3" wide. These are new production and come shrink-wrapped from the manufacturer. Players include Bart Starr, Paul Hornung, Bob Jeter, Travis Williams, Willie Wood, Herb Adderley, Chuck Mercein, Jim Taylor, Donny Anderson, Ken Bowman, Fuzzy Thurston, Jerry Kramer, Ray Nitschke, Henry Jordan, Forrest Gregg, Bob Skoronski, Carroll Dale, Max McGee, Boyd Dowler, Willie Davis and Dave Robinson.